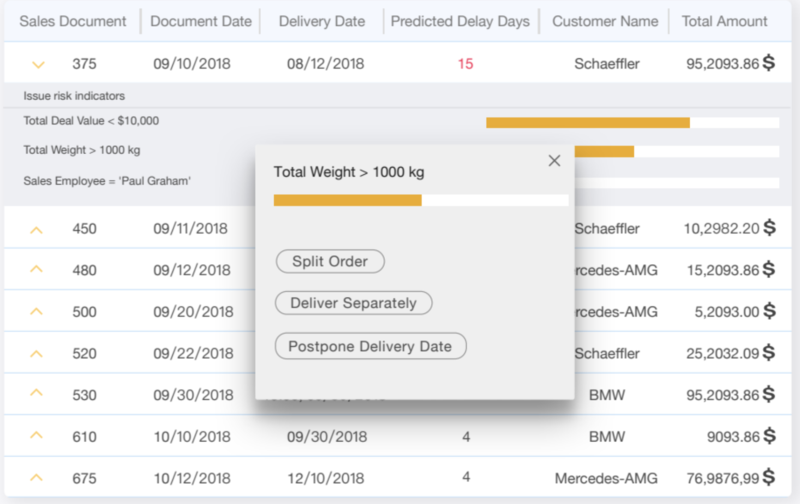 Detect and prevent delivery delays before they happen! Delayed deliveries are hurting your business more severely than ever. Today’s customers are less tolerant of delays and put off by backorders. We have all become used to a higher standard of service, brought on by Amazon.com and other large internet retailers. Companies with fewer delivery delays will have higher customer satisfaction and retention, less operational costs, and are therefore more likely to win. Most companies can’t see delays before they occur. They are forced to react to them as they happen which is often too late. The process is already interrupted and more time has to be spent fighting fires. 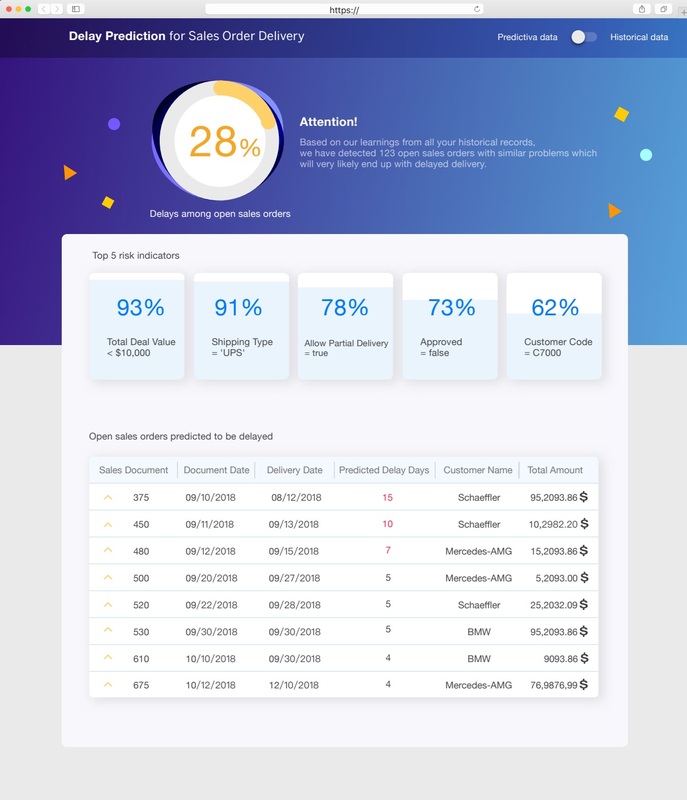 Here comes DelaySniffer, a smart tool which analyzes your historical data, monitors open sales orders, warns of possible delays and suggests solutions to stop delays from happening in the future. With DelaySniffer you can know about delays in advance, you can take early actions to prevent them, or at least notify customers about delays to mitigate dissatisfaction. DelaySniffer shows the overall ratio of predicted delays. It warns you if that ratio gets too high and the situation might be overloaded. All delay-prone sales orders are listed, together with the top 5 risk indicators for those predicted delays. You can drill down to investigate root causes and take immediate actions on the sales orders. DelaySniffer always keeps an eye on open sales orders. Whenever a sales order is updated or a new one is created, the prediction will be re-done and updated to the report. DelaySniffer is smart enough to suggest possible solutions with preconfigured actions for many common issues. For example, to resolve the risk “Total Weight > 1000kg”, all you need to do is choose an option and the relevant operations will be carried out automatically. Over time the algorithm remembers the decision you made. At a certain point it will become confident enough to perform the action automatically without even asking. DelaySniffer can also help you learn from the past and change for the better. 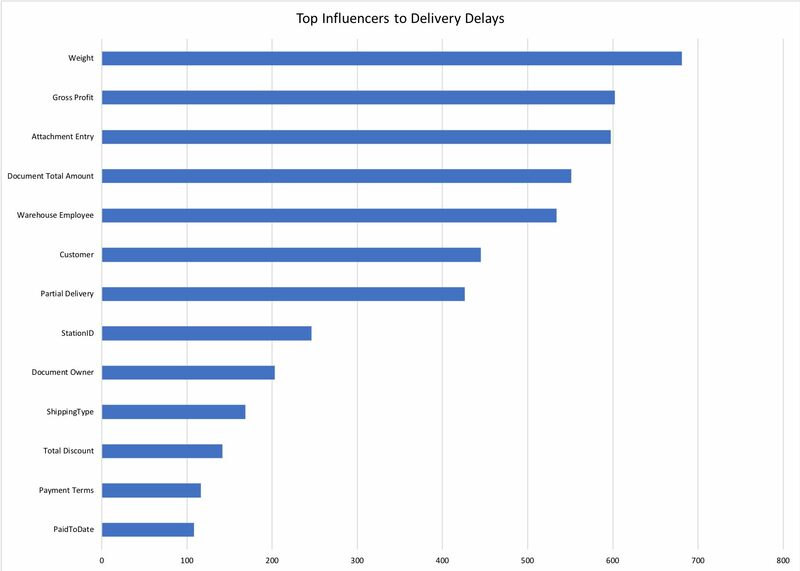 The reasons for delivery delays can vary, and in many cases they are hard to perceive. Some issues, such as a bad practice, only become obvious when looking back at historical data in a statistical way. 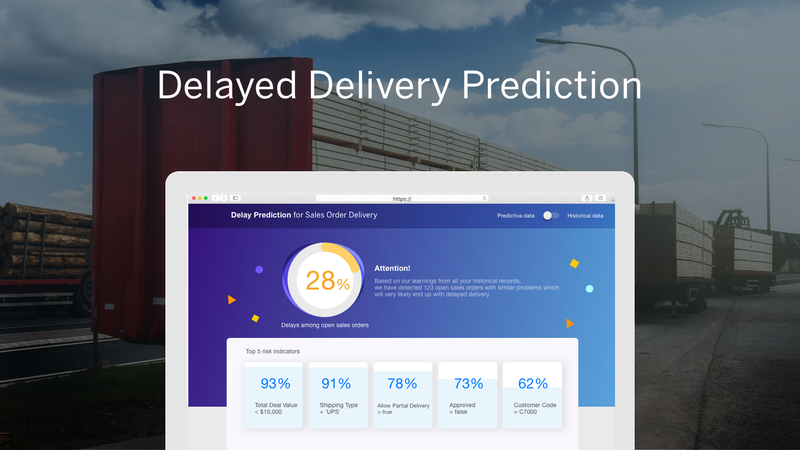 Through data science and machine learning technology, DelaySniffer is able to reveal the factors most closely related to delivery delays, so that you can make adjustments and keep away from those risks in the future. Some influencers may be logically directly connected; if Gross Profit or Total Amount is low, the delivery is more likely to be delayed because the sales order may be perceived as less significant to the business. Some are less obvious. The exact reason why Weight or Attachment Entry is so closely related to delays for this particular customer are unclear on the surface but reveal deeper root-causes if taken into consideration by the business. DelaySniffer provides insights that may not be uncovered by experience or by bare-eye examinations. Are you an SAP Business One user and make routine deliveries? Let DelaySniffer scan your orders and get free insight into your businesses’ potential for recognizing and fixing delayed deliveries. Register here to join the free beta program. Would you share any requirement to participate in the Beta program such as having to be B1H and the required version? Is it also possible for B1 partner to join the beta program to try it out first? There’s no particular requirement on B1 version(preferably after 9.3 PL02); both HANA and SQL Server are fine. B1 partners are also welcome to join the beta program, just click on the link and register.